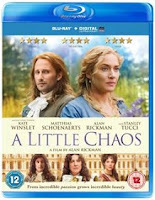 A Little Chaos is released on DVD and Blu-ray on August 24th, and to celebrate we have a great competition for you and 3 copies to win on Blu-ray. When brilliantly talented landscape gardener Madame Sabine De Barra (Kate Winslet – Labor Day, Revolutionary Road) finds herself an unlikely candidate for landscape architect of the still‐to-be-completed Palace of Versailles, she is thrown into the bewildering world of the court of King Louis XIV (Alan Rickman – Lee Daniels’ The Butler, Harry Potter and the Deathly Hallows). She has little time for the classical, ordered designs of her employer, the famous architect Le Nôtre (Matthias Schoenaerts – Far From The Madding Crowd, Suite Francaise), but as she works on her creation, she finds herself irresistibly drawn to him, while attempting to negotiate the perilous rivalries and intricate etiquette of the court. A wonderfully sumptuous drama set in some of the most stunning gardens in Europe, A LITTLE CHAOS boasts an all-star supporting cast, which includes Stanley Tucci (The Hunger Games: Mockingjay Part 1, The Devil Wears Prada), Helen McCrory (Skyfall, Being Jane), Jennifer Ehle (The King’s Speech, TV’s Pride and Prejudice) and Rupert Penry-Jones (Match Point, TV’s Persuasion). Who is the director of A Little Chaos?